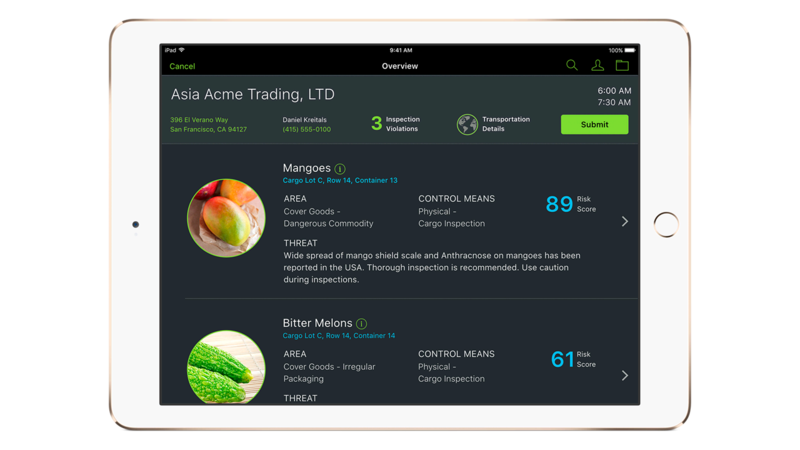 IBM MobileFirst for iOS Field Inspect speeds up the pace of field inspections by giving inspectors all the information they need – procedures, inspection history, visual- and text-based guidance, notes and access to expert resources. Inspectors can capture evidence for reporting, including photos, videos, audio recordings, signatures and documents. Items are tagged with GPS, date and time data for inclusion into central systems of record. Contextual information for each item to be inspected includes electronic and scanned documents, emails, texts and calls. Inspections are prioritized by urgency and aided with pre-populated Q&As and links to help to reduce data entry errors. View potential risks and likelihood of failed inspections. Contact experts via phone, text or FaceTime and see relevant documents. Fill in forms pre-populated with details from the location and get help on unfamiliar questions using familiar iOS icons. Photos, videos, comments and calls can be attached to relevant items. Build and edit form workflows to match your organization’s inspection types and needs.